Indeed, that’s been the trend in the Premier League this season; unforced rotation has almost non-existent amongst the top clubs this season because they’ve just been unwilling to deviate from a formula. Arséne Wenger may have thought about resting Robin van Persie had his team played on the same day as everybody else but the dropped points from his closest challengers gave Arsenal an window of opportunity they had to take. One of those changes saw Yossi Benayoun slot in on the right, making only now, his first league start for Arsenal as Wenger finally budged on his three striker system. Nevertheless, Benayoun was detailed to play more of a direct style instead taking a creative role although he still contributed with the assist for Arsenal’s only goal. But, such has been their luck this season, Wolverhampton equalised though a fortuitous goal and then survived an onslaught in the final third of the game as goalkeeper Wayne Hennessey performed heroics to deny Arsenal. As mentioned Benayoun started on the right although he constantly swapped positions with Gervinho throughout the game. Tomas Rosicky also began the game and much of early impetus came through him. As Ramsey has, Rosicky undertook a energetic role although with a bit more finesse and was unlucky that some of his through passes did not find their men. Indeed, the front men started so dangerously in the first thirty minutes but in lacking that conviction in the final third, it always gave Wolves hope, even if they hardly saw any of the ball. At the end of the game, as Arsenal threw everything forward, it wasn’t necessarily creativity that suffered although Wenger might not have saw it that way; they just could find a way past Hennessay. Wenger on the other hand felt Arsenal betrayed a bit of their technical philosophy and they should have kept a calmer head. Perhaps that’s why Benayoun was taken off even though he might have been the type of player which suits that occasion. Benayoun had a pass accuracy of 61% and although he created two chances, his care-free approach saw him replaced. <Figure 1> Yossi Benayoun’s game is certainly laden with risk as he seeks to attempt the killer-option. 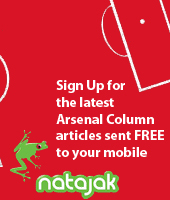 He may have been partly inaccurate but it presents Arsenal a different option; one which none of the wide players have. The issue is, will Wenbger deviate from his three striker ploy? Van Persie has an extraordinary goalscoring record this season but he’s also taken a ridiculous number of shots. 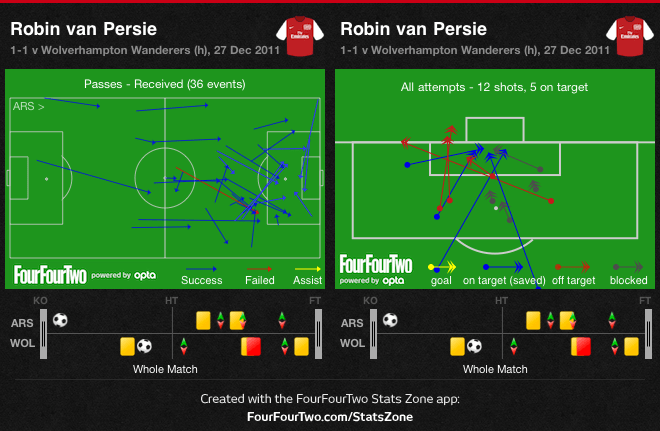 Against Wolves, van Persie attempted 12 shots with five on target. He should have probably scored and he looked more dangerous, as he has all this season, playing up the pitch. His movement was fantastic and as well as getting behind on more than a number of occasions, he dragged the Wolves defence all-over the pitch. On the other hand, his link-up play can be erroneous as a heavy touch and too much time on the ball can retard his impact. His spontaneity has been his biggest strength and while he was unable to use it to his full advantage and he became desperate after the break, he was still Arsenal’s best chance of winning. <Figure 2> Van Persie pass received and shots attempted. Andrey Arshavin isn’t having the best of relationships with the fans; his introduction was met with groan and bemused looks and some things he attempted achieved the same reaction. He had one snap shot, showing the unpredictability Wenger was banking on. His chalkboard below isn’t so interesting except that what failed, happened on the right; the rest was accurate. It probably shows that he is not a crossing type – that of which he attempted at the end of the game from the right – while he mostly looks to play quick and go’s inside – the ones on the left. His position echoes another substitute’s, Marouane Chamakh, who again failed to make an impact. His time is ticking. <Figure 3>Andrey Arshavin’s peculiar pass chart. 4. Aaron Ramsey: a viable full-back option? 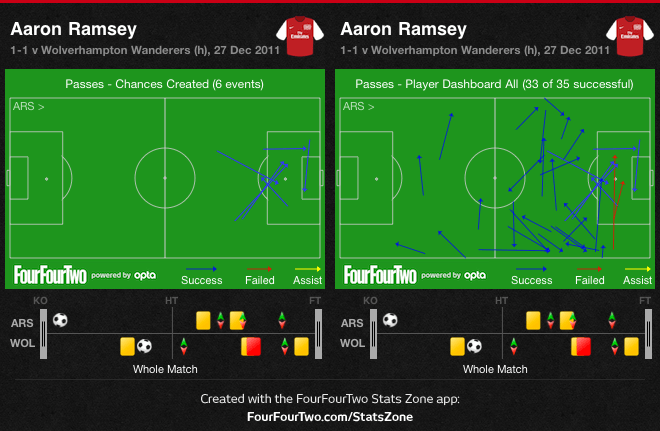 As Arsenal chased the winner, they dropped Aaron Ramsey into full-back. His first contribution after his immediate arrival was to drive at the Wolves defence, nearly putting in Robin van Persie. 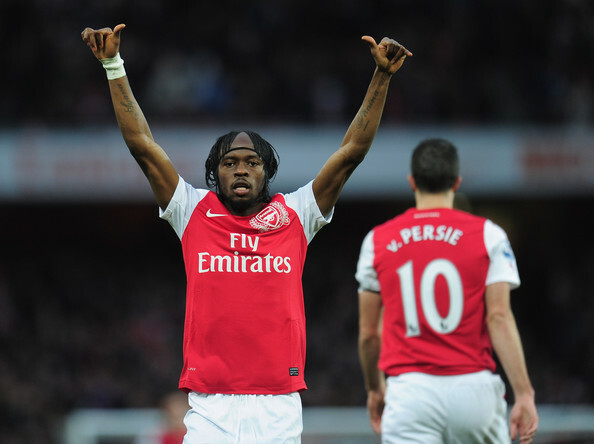 He was later playing at right-back and was able to provide the passes and drive Johan Djourou was not. 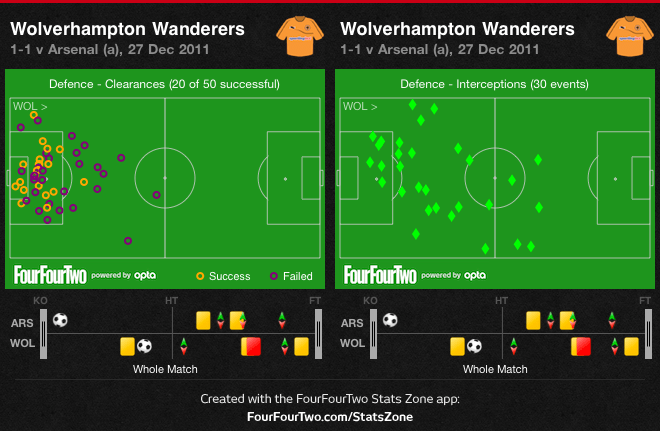 Certainly this was against backs-to-the-walls opposition therefore Wolves were unable to test his defensive game but with wing-backs being an important part of Arsenal’s play, perhaps is not such a far-right option. Wolves deserve some praise – if indeed most. Arsenal played well but ultimately failed to break through and that must go down to some brave defending and a little bit of luck. A moral victory may be that they forced Arsenal to crosses and not enough ground play in the final quarter of the game. Nevertheless, the defence and crucially, Wayne Hennessey, got in the way for Arsenal.